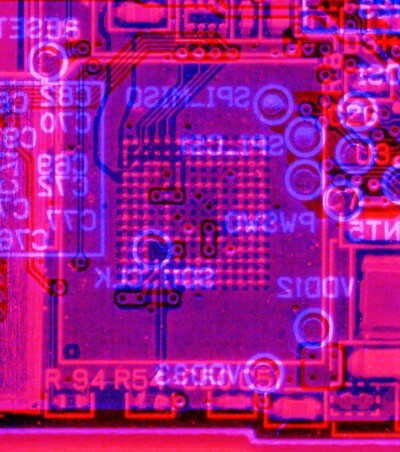 It seems like a lot of people have been seeing my Flickr photostream and wondering what I must be up to- especially after my photos got linked on hackaday and reddit. Well, I’ve been meaning to write a detailed blog post explaining it all- but I keep running out of time. So I guess a “short” blog post is better than nothing. 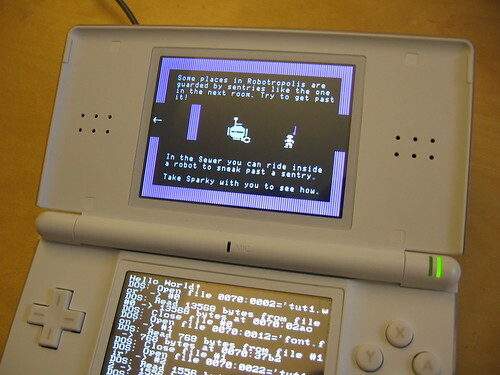 The executive summary is that I’ve been working on making it possible to run homebrew games on the DSi. If you’ve used The Homebrew Channel on the Wii, you know what I’m talking about- we’d basically like to have the same thing for the DSi. And as it turns out, the DSi has a lot in common with the Wii. I haven’t been working on this project alone. I’ve been collaborating with the excellent software and hardware engineers in Team Twiizers, the group responsible for The Homebrew Channel. Bushing has written a couple blog posts about our DSi efforts so far: one on the RAM tracing effort in general, and one with a sample trace. My role in this project lately has been building hardware and software for a tool which is effectively a low-level CPU debugger for the DSi. It attaches to the RAM bus between the RAM and CPU, it’s capable of tracing all traffic in ‘real-time’ (after slowing down the system clock so the required bandwidth fits in USB 2.0), and just this week I got RAM injection working. The hardware interposes on one of the chip select signals between the CPU and RAM. If an address floats by that we want to patch, the hardware can quickly disable the real RAM chip and drive new data onto the bus as the CPU continues to read. It’s a very effective technique, and my hardware has a pretty capable system for storing and retrieving up to 16 kB of patch data now. Several of us managed to run code from within a DSi-enhanced game using modified save files, but most of the interesting hardware on the DSi (like the SD card slot, and the internal flash memory) is disabled when these games are running. The earlier Team Twiizers Classic Word Games hack, WinterMute’s cookhack, and my own cookinject all suffer from this problem. I’ve been able to read and write flash memory for a while. This isn’t as interesting as it may sound, since nearly all of the flash is encrypted. 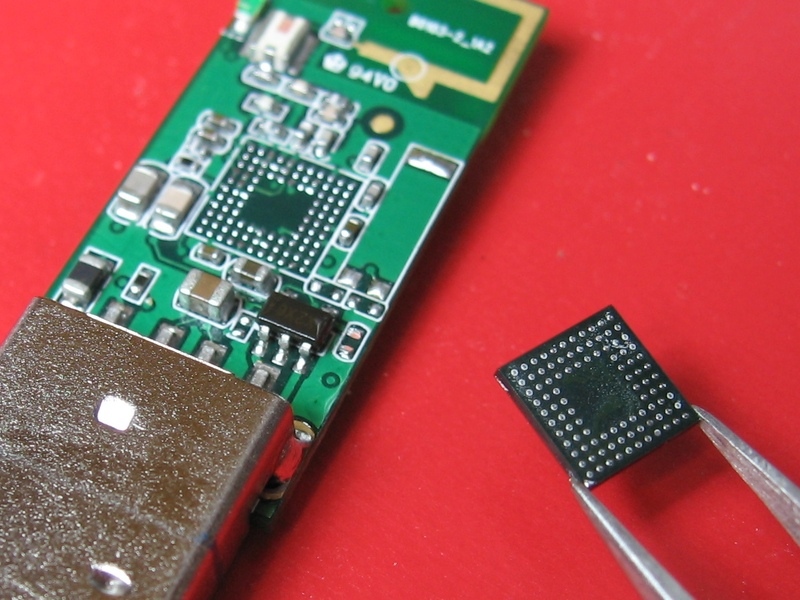 However, by running a lot of tests where we modified or compared the encrypted data, we were still able to gain a lot of knowledge about the layout of the flash memory, and some information about how the system boots. What we’d really like to do is understand more about how the console’s main menu works, and how software is installed and loaded on the DSi. The best way to do this seemed to be RAM tracing. It required an FPGA and a lot of crazy soldering under a microscope, but now it’s working and we’re well on our way to unlocking the secrets of DSi homebrew. If you’re interested in following our efforts to make homebrew possible on the DSi, definitely subscribe to Bushing’s blog at hackmii.com. He understands the Wii (and by extension, the DSi) better than I ever will, and he’s great at writing about it. If you’re interested in the C and Verilog source code, it’s in Subversion as usual. 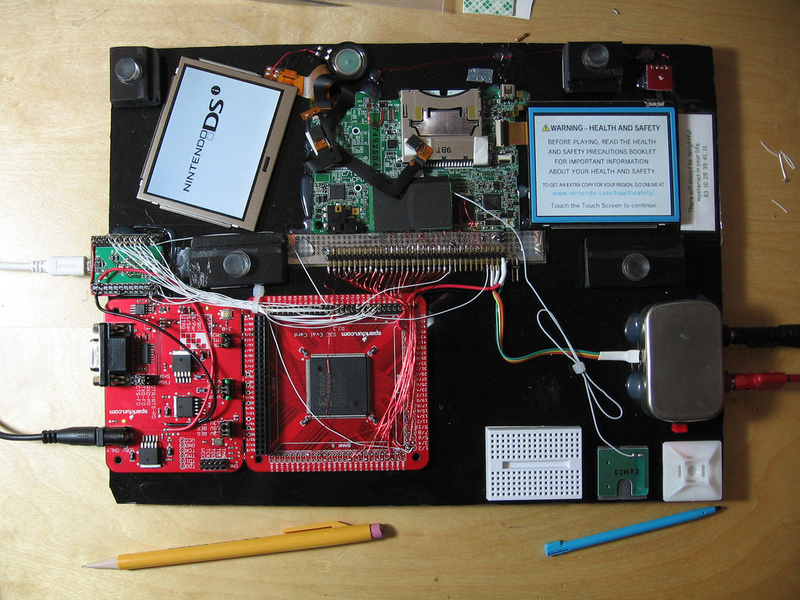 This entry was posted in DSi, Portfolio and tagged ds, fpga, hacks, microscope, nintendo, reverse engineering, soldering on September 16, 2009 by Micah. 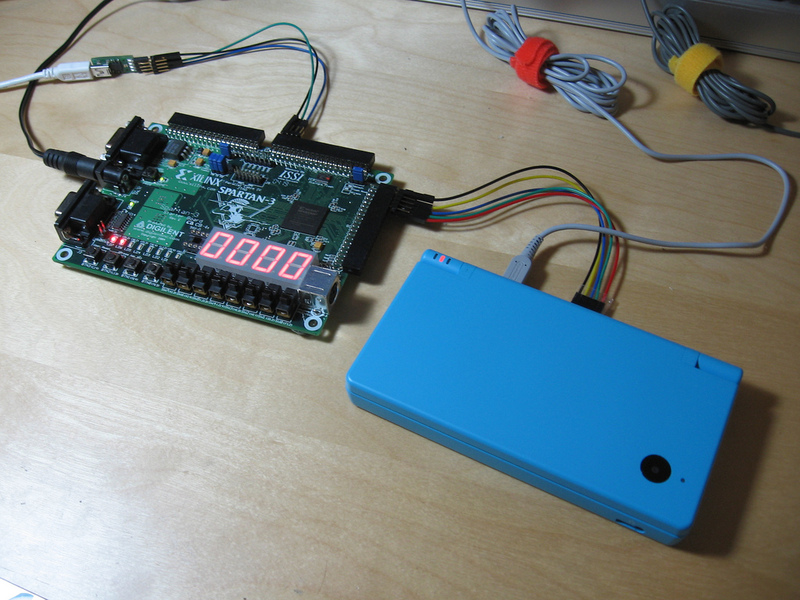 This is an FPGA emulating the SPI EEPROM (save game memory) in a modified Nintendo DS game cartridge. The emulated EEPROM is backed by 1 MB of SRAM, and there is a USB interface that you can use to simultaneously read or write the SRAM from a PC. You can use it to really quickly modify or inspect the contents of a game’s save memory- for example, for developing save game exploits or reverse engineering save file formats. 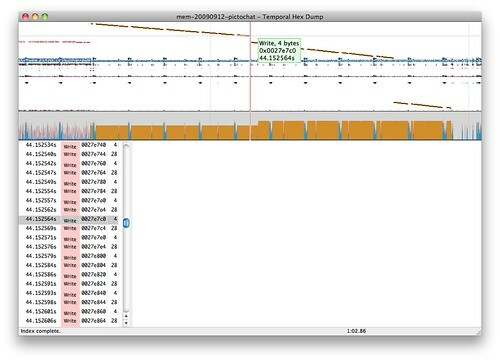 You can also use the large memory space as a fast shared memory buffer, for sending debugging information or memory dumps back to the PC, or for loading larger blocks of code from the PC. The FPGA design is written in Verilog, and I’m running it on the popular Digilent Spartan 3 board. The upload/download tool that runs on the PC is written in Python, plus it can be used as a Python module for writing more complex tools that interact with the DS through this shared memory buffer. Source code is in Subversion, and released under an MIT-style license. 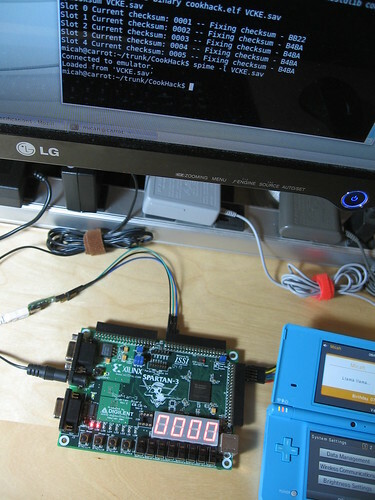 This entry was posted in DSi and tagged ds, eeprom, emulation, fpga, nintendo, spi, verilog on August 5, 2009 by Micah. 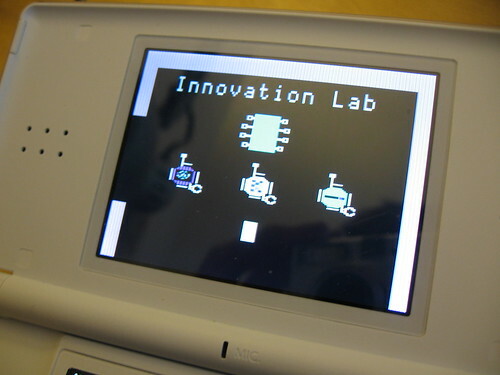 The DSi is pretty cute, but it would be nice if we could use its new features for homebrew software. It would be especially cool if you could run homebrew directly from its built-in SD card reader, without the need for any special-purpose hardware. That would really open the door to some cool indie games that nearly anyone could play. There are a few other people working on hacking the DSi from other avenues. Team Twiizers just released a video of a save game exploit that they’re using to run code in DSi mode. This is pretty cool, and as far as I know it’s the first time a hobbyist has been able to run code in DSi mode. I’m not sure how much if any of the new hardware they’ve managed to reverse engineer through this hack. There are also a handful of Wii hackers that have noticed that the DSi has pretty much the same file format for its downloadable games, so they’re trying to come up with a way to install homebrew DSiWare apps. Unfortunately, they need the system’s private key- and brute-forcing it doesn’t seem too promising. One way to get this private key would be to extract it from the DSi’s firmware. The thing that interests me the most right now is figuring out how the DSi boots. There are plenty of other layers of software that you can exploit from the outside- but the bootloader and built-in firmware seems like the best starting point for any serious effort to reverse engineer the DSi’s hardware. The DSi has upgradeable firmware, and there’s only one visible place that it could be stored: a 256 MB NAND flash chip. This is actually an embedded MMC (eMMC) chip from Samsung. It’s electrically pretty much the same as an MMC card, but in a tiny BGA form factor. It is wired directly up to the CPU, which would indicate that there is some kind of hardware or software bootloader that knows how to pull code off of the eMMC chip during early boot. This probably means there’s a mask ROM in the same package as the CPU. It would also make sense that this ROM would know how to write an initial firmware image to the eMMC chip during manufacturing, since there is no other way to access the eMMC chip after it’s soldered to the DSi’s main board. I was hoping that the MMC data lines would be accessible via some of the many test points. None of them were obviously related to the NAND, though. I tried probing the SPI bus, where the original DS kept its firmware, but the eMMC chip was definitely on a separate bus. It didn’t help at all that the DSi refuses to boot unless every single one of its peripherals are attached, so this makes it rather hard to poke around the board’s test points while it’s running. 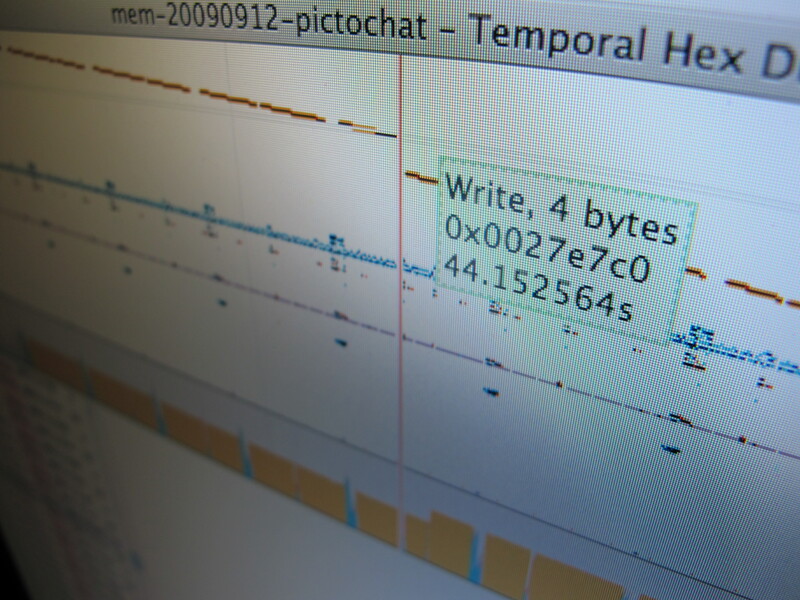 At this point I assumed that the traces running from eMMC chip to CPU were completely buried. My last recourse: desolder the eMMC chip, and hook it up to some kind of test jig that would let me read back its contents. Then perhaps I could copy it to a normal MMC card, and wire up an MMC socket on the DSi. 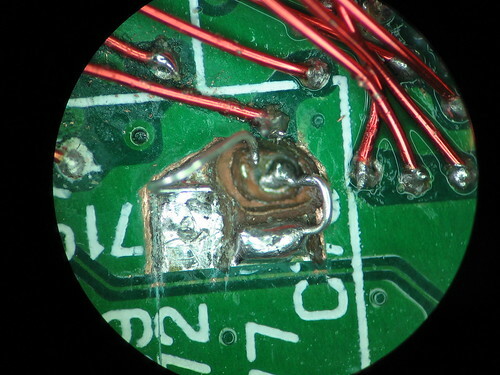 After practicing my BGA rework technique a bit, I desoldered the eMMC chip. If you power the DSi on without the eMMC chip, it displays a nice hexadecimal error code. This would seem to indicate that there is indeed a mask ROM in the CPU package- a hardware bootloader wouldn’t be smart enough to display a “nice” error like this. There was a pleasant surprise underneath the eMMC chip: All of the data signals were in fact accessible on nearby components or vias. I didn’t find them earlier, since I couldn’t really poke around with the ‘scope and have the board access the eMMC at the same time. But, armed with this knowledge, I could switch to a simpler approach: Solder the eMMC chip back on, then build a passive sniffer that tells me exactly what reads and writes the DSi’s CPU makes. By some miracle, I managed to get the eMMC chip soldered back on successfully. 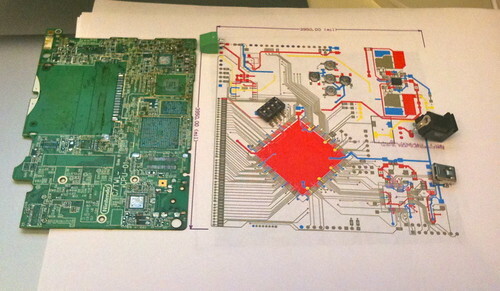 The DSi’s mainboard is a huge pain to do BGA rework on, at least with the tools I have. It has so many ground/power planes and fills that the board is really hard to keep hot with just a hot-air rework tool. More stuff: There are a few more pictures on flickr, and I started a thread with a few more technical details on the gbadev forums. This entry was posted in DSi and tagged console project, ds, nintendo, reverse engineering, soldering on July 18, 2009 by Micah.